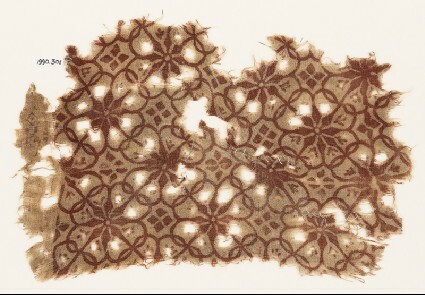 Interlocking floral design, similar to Cat. no. 288 [EA1990.297]. Again, the focus of the design can be shifted, although the pattern is more clearly defined by a single co0lour, red in this case. In addition there is a narrow band of linked diamond shapes, dyed purple. Irregular stitching in the middle of the fragment. A corner of the block used is visible. The purple band is very faint. The pattern is slightly blurred on the reverse. Possibly 13th century, see Cat. no. 296 [EA1990.305].